Have you been worried that robots might one day become smart enough to rebel against humans? If so, you may now have cause for even greater concern. That’s because a team of Swiss scientists has been training four-legged robots to be more agile and durable. 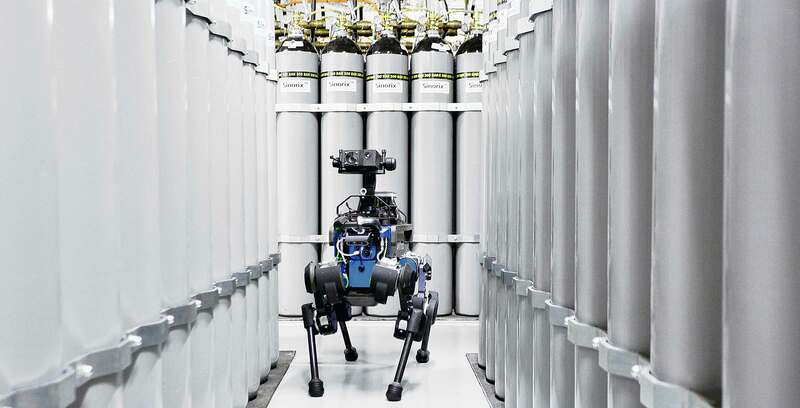 The robot is called the ANYmal and is being developed by the ANYbotics team at the Zurich-based Swiss Federal Institute of Technology’s Robotic Systems Lab. In a paper published in Science Robotics, ANYbotics has outlined exactly what sort of (arguably) ill-advised work it has done on the ANYmal. Specifically, the team has figured out how to make the ANYmal move faster while also being more resistant to attempts to knock it down. Using a complex neural network, the researchers were able to translate simulation data to the robot more easily than before. These simulations were already able to be carried out nearly one thousand times faster than they would have taken in the real world, so this made the entire process even smoother. The robots were then put through trial-and-error testing using the simulation data until they could learn and adapt accordingly. In practice, this resulted in an ANYmal that could move up to 25 percent faster. Further, the ANYmal was able to flip itself upright after being knocked down, something the engineers say they haven’t yet seen happen with a robot of this complexity. This might sound like they’re just making the robots harder to fight when they inevitably try to destroy us all. However, the Swiss Federal Institute of Technology intends for the robot to use this added mobility and sturdiness (as well as its waterproof nature) to traverse less-than-ideal conditions like snowy landscapes.